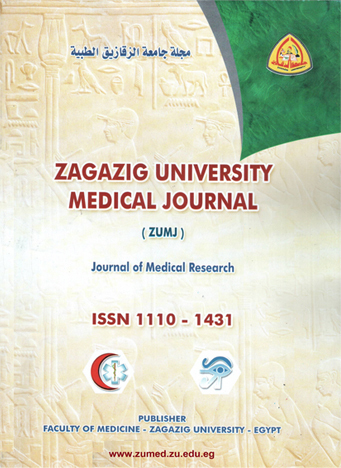 1Internal medicine Faculty of Medicine, Zagazig University, Egypt. 2Radiology Faculty of Medicine, Zagazig University, Egypt. 3Pathology departments Faculty of Medicine, Zagazig University, Egypt. Background: Hepatocellular carcinoma is one of the most common cancers worldwide. Primary known risk factors for HCC are Hepatitis C virus (HCV), Hepatitis B virus (HBV) and alcoholic liver disease. There is little information about occult HBV and its relation to HCC in chronic . We aimed to evaluate the prevalence and the possible clinical impact of occult HBV infection in chronic HCV patients with hepatocellular carcinoma. Patient and methods: A total number of 140 patients with hepatocellular carcinoma were examined, 118 patients were included in this study. They had positive HCV-RNA, negative HBsAg and radiological evidence of Hepatocellular carcinoma, previous antiviral therapy or serological evidence of autoimmune hepatitis and were divided into two groups according to their HBc-Ab status: Group (I) 93 patients positive for HBc-Ab (Occult HBV/HCV dual infection), Group (II) 25 patients negative for HBc-Ab (HCV mono infection). The rest of HCC patients were coinfected with HCV and HBV, 8 patients had HBV infection (+ve HBV sAg and –ve HCV Ab) and 4 patients had negative tests for both HCV and HBV were excluded. Results: A statistically significant increase in serum levels of AST, ALT, bilirubin, Alpha-fetoprotein with more cirrhosis, ascites, liver decompensation (according to Child-Turcott-Pugh score) and more hepatic focal lesions and malignant portal vein thrombosis (through radiological diagnosis) in Group (I) as compared to Group (II), while there was no statistically significant difference among Group (I) and Group (II) as regarding PT% or spleen size. Conclusion: Occult HBV infection is extensively common among HCC chronic hepatitis C infected patients and presence of occult HBV infection is associated with more deterioration of liver status.